Keeps the hose out from underfoot! Attach to your faucet. This hose/nozzle set provides a good pressure stream of water for washing and rinsing your horse and equipment. 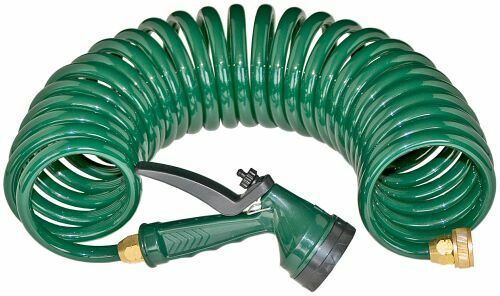 The hose stretches 25 feet and will self-coil back into position after use. Eliminate problems from tangles and kinks with this hose. The sprayer has an adjustable dial that will change the pressure and flow between mist, jet, cone, flat, soaker and shower. It is safe to use for drinking water. It withstands low and high temperatures. And, it is bio-degradable.